Q: How is Bulgaria’s mobile broadband Internet segment performing compared to other markets where Telekom Austria operates? A: We have a huge potential in mobile broadband Internet that we can utilise. In the last few quarters Mobiltel has a very significant increase in the number of mobile broadband users, in the second quarter we had a more than 120% increase compared to the same period in 2010. This is one of the biggest increases in Central and Eastern Europe and we are very proud of it. This is the positive side of the coin. The negative side is that mobile broadband penetration in Bulgaria is the lowest in the European Union. So we have reached now approximately 3.5% compared to a 7.5-8.0% average in the EU. This means huge investments are required from the operators, and this is really the big challenge. On the one hand, customers require much higher speed and capacity and, on the other, revenues are shrinking, meaning that we have to adjust investments as well and this is the big challenge facing us in the next couple of years, not just on the Bulgarian market. 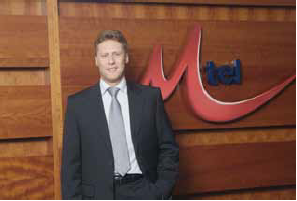 Q: What is the share of users with mobile broadband data plans in Mobiltel’s overall subscriber base? A: The share of traffic related revenues in the second quarter of this year is close to 28% and this is a huge increase compared to the same period in the previous 2010. Compared to other comparable countries like Serbia, Macedonia, and Romania, we are quite well positioned in Bulgaria with this share. Of course, in other countries, some highly advanced markets like Austria, the Netherlands and Italy, this share is approximately 45–50%. Our goal is to bring our share in Bulgaria up to this level, I would say that 40-45% is definitely a feasible target in the next two to three years. The subscribers share is approximately 6.0%, which is two times more than one year ago. Q: What is the share of smartphone users in your customer base? What share do you target? A: The number of smartphone buyers and smartphone users is definitely increasing significantly in a year-on-year comparison. Smartphones are simply the future. We already have a huge percentage of handset sales volume generated by smartphones – approximately 21%, which is two times higher compared to 2010. In smartphone sales the goal is to increase the share to maybe 40% or 50%. There is an excellent potential for growth here too. It is a fact that the year over year sales volume of smartphones has increased by 40% for the first eight months of 2011. This goes hand in hand with the growth of mobile data traffic. Our clear focus is to hold more and more campaigns and promotions in order to point out the advantages for the customer in buying a smartphone and support this increase in the next couple of year. In terms of smartphone users, the subscribers with smartphones have increased by 30% compared to July last year. I think if the trend for year-on-year growth continues in the next two or three years, I will be very satisfied. Q: How is the tablets market performing? A: Tablets are another story. First of all, what we need to do is communicate in the right way and convince the customer of the difference between a smart phone and a tablet. The functionality of an iPad and an iPhone is more or less the same. Of course, an iPad is much more convenient to work with, especially when you check emails with presentations, or when you are surfing the Internet, and here we need still to explain the advantage of having an iPad and an iPhone, and generally, having a smartphone plus a tablet. Unfortunately, in Bulgaria tablet sales are not very promising but we have clear plans, especially for the Christmas period, and for the next year to focus on tablet sales. This device needs to have a reasonable price. Q: How are your plans for the launch of services based on Long-term Evolution (LTE) technology progressing? A: As a market leader, Mobiltel is the first to hold a demonstration of how an LTE network works, to show the difference of having LTE compared to having 3G. With LTE you are reaching up to 100 megabits per second. This will change the mobile world in the next couple of years. A commercial launch depends first of all on the licence itself, and the regulator has still not decided when there will be a tender for the licence, or when the licence will be awarded. I would expect it to happen some time next year. Commercial launch also very much depends on the availability of LTE-enabled devices. Devices are still too expensive and you do not have a really big choice. So I cannot tell you when we are launching it but definitely we will be the first one to do so. You have to realise that we still have a lot of potential to utilise in terms of our 3G network, and then go on to the next stage. Q: Following the acquisition last year of local cable operators Spectrum Net and Megalan, Mobiltel committed to building out its fibre-optic network. Could you provide an update on that process? A: Our fibre optic deployment is definitely very satisfying because we are reaching by the end of the year roughly one million households in Bulgaria, and this is a huge potential, especially in Sofia and in some other big cities. We just launched in Plovdiv our fibre optic network. We are moving forward. We are aiming for further deployments in Sofia, Varna, Burgas, Plovdiv and then in Stara Zagora, Veliko Turnovo, and some other cities as well. We have a quite satisfying growth. Fibre optic is a precondition to offering in the future a connected home. A connected home means you can enjoy everything – you have the highest Internet access of up to 100 megabits per second – by far the highest in Bulgaria and in the EU, you have a mobile phone, you have a fixed-line phone, you have IPTV-delivered entertainment where we offer special content like video-on-demand and other content that we will bring next year, and in addition all your electric circuitry is connected so you can handle surveillance services and different remote controls. This is the vision that we have at Mobiltel. This is why we went into this strategic direction and bought two companies – Spectrum Net and Megalan, and started to deploy fibre optic infrastructure in Bulgaria. This vision is already partial reality and what we need to do in the next 12 to 18 months is combine all the services that we are already offering. It is no secret that such a deployment of a fibre optic network costs a lot of money and I would like to emphasise that we have been the biggest investor in terms of telecommunications infrastructure for years. The overall investment in Bulgaria’s telecommunications sector is roughly 450 million euro, and more than 60% of this comes from mobile operators, meaning a big portion comes from us. In 2010 we invested, including in the acquisition of the two companies, 150 million euro in Bulgaria and we are continuing this intensive investment plan this and next year. First of all, we would like our fibre optic network to cover the main cities and then, if we see economic sense, we are moving to the rural areas. However, in the rural areas our goal is to use the mobile infrastructure because, especially with 3G, you can provide very good coverage in rural areas and it is much cheaper than laying a cable. Unfortunately, there are areas in Bulgaria where there is no infrastructure at all. In the past nobody was investing in these areas, so we are the first. Q: The Bulgarian telecoms regulator recently announced it plans to cut termination rates twice in 2012 and once more in 2013. What will be the implications of these moves for Mobiltel? A: I have been working in this industry for 17 years in different countries and I am really surprised that this is such a big story in Bulgaria. The regulator is saying it will bring down the prices of mobile telecommunication very sharply, and this is simply not true. Interconnection prices are the prices that the operators are paying to each other, they have nothing to do with the end consumer price. Bulgaria has the lowest end-consumer prices in the EU according to the 16th report of European Commission; the wholesale prices do not have significant effect on the consumers. We are not against a decline in termination rates and we will definitely apply it, but it needs to be done in a very professional way, reflecting the market situation as all operators will lose from this and this would finally reflect on investments. Since 2007, when Bulgaria entered the European Union, we have started to gradually reduce wholesale prices. We are still above the EU average, but now suddenly the regulator is coming with a proposal that the price should go down below the EU average, taking as a benchmark highly advanced markets such as the Netherlands, France and Italy. But we don’t need to be world champions here. My proposal is for a reasonable decrease to the EU average, and hopefully we will have here a discussion and rational thinking, not populism.